Hey guys, I just have a quick question about a GloFish Tetra. He's in a tank with several others, and he always ate normally, and was usually the hog. I cleaned the water just a couple days ago, and now he seems to have decreased in eating activity. Could you tell us your water parameters? And how did you clean the tank? Well, I have test strips, which don't work the best. I used a gravel siphon, and took about 25% from the tank. I don't have strips that test ammonia, plan to get a liquid kit soon. Could he just be overfed, because of being a hog? I think you may have lost your cycle. How did you clean the tank? Did you clean the filter/replace the filter cartridge, ect? Is your tank cycled? You need some ammonia, nitrite, and nitrate test kits asap. I do not think hes overfed. I''ll have to send a picture of him only. No I didn't replace the cartridge, the tank is 2 weeks old. Was this your first water change? Did you completely take out all the water and put new back in? Did you use a water conditioner? Please answer these questions! I want to help but can't if you don't give us some info . What size is your tank and how many fish do you have in it? Hmmmmmm. Are all the others fine? How did you find out it was cycled if you don't have ammonia, nitrite, or nitrate tests? We cycled it prior to adding fish. Yes, the others are great. Hes still eating right? Just not as much? Does he eat as much as the others do? Do you have a variety of foods you use? He skipped Dinner last night, and breakfast this morning. About to feed them now. bloodworms sound good. I don't know... Have you seen him poop? I haven't seen any of them poop. But I know they have. Will he starve himself if he continues to not eat? He didn't at dinner tonight. 1. Your tank is cycled in only 2 weeks..? I highly suggest getting a liquid test kit. 2. I think your tank is over stocked. Depends.. how big are these glofish, about? The electric green is the largest, about two inches. The others aren't longer than an inch. Mmmk your first issue is your tank may be over-stocked.. im aware they are on the smaller side, however schooling fish are active swimmers and having a school of em, they may just be cramped. Your second issue is not properly cycling your tank. There is NO way you or I can know if your tank is cycled.. He usually stays in the same spot, but he occasionally moves. He's only skipped 3 meals in 2 days. But he ate all the time before. Can you get your water tested at your LFS? Ask them to test for ammonia and nitrites. No, he will not starve. Fish can go two weeks without food. How did you cycle your tank and find out that it was cycled? I think more attention needs to be drawn to the fact that the tank is far too small for your Tetra. Glofish are generally derived from White Skirt Tetra, which require at least a 20 gallon tank. That's 4 times the size of the one your school is in now. No matter what you do to remedy this issue, the underlying problem will still remain until you get them into a tank that better suits their needs. If you can't upgrade to a suitable tank, i'd be looking at rehoming them ASAP. I am fighting a losing battle with ammonia in my tank. Which is the reason I am upgrading. I am doing a 50% water change every 3 days at this point because of it. Even with a fully cycled tank, the bioload is too great for the size of the tank. Just today I had to do 2-50% water changes just to get my Ammonia under 0.25. Now as far as a fish not eating. It will be directly related to the stress from the tank being too small for them, and the water quality being compromised because of it. I was in the same boat as you. Virtually identical when I started my tank back in October. I had a 5 gallon with 3 glo-tetras. Then upgraded to a 10 gallon and got 2 more tetras and the DG. Then in February I found this forum and figured out I had been doing absolutely everything wrong. Since then at the very least I have been working towards getting a suitable situation for my fish, and keeping them as happy as I can in the meantime. It has been a lot of work. Much more work than I would care to admit. First thing you need to do is purchase an API Freshwater Master Test Kit (liquid). Then you need to get Seachem Prime. Prime will detoxify the ammonia in your tank for 24-48 hours. It also is a dechlorinator for your water changes. It will protect your fish while you get things in order. I would also get Seachem Stability. It works with Prime and will keep your cycle together with all the water parameter issues. 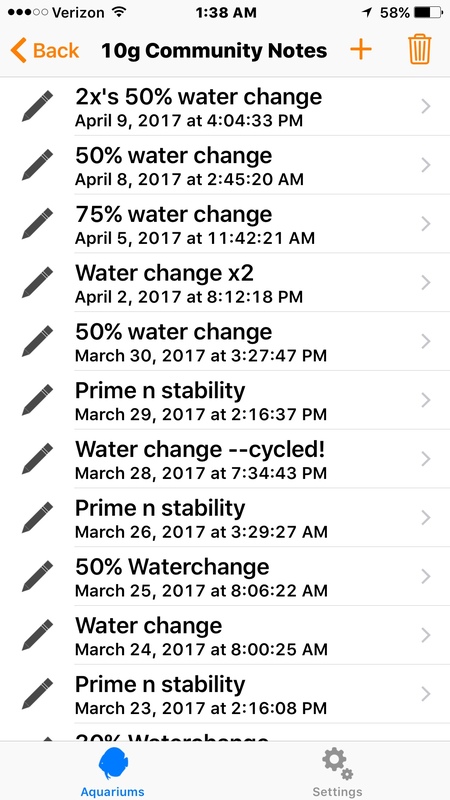 Here is an indication of how many water changes I have done in the last few weeks. Possible Tumors On Glofish Tetra? Elite Mini Filter For Glofish Tetras?